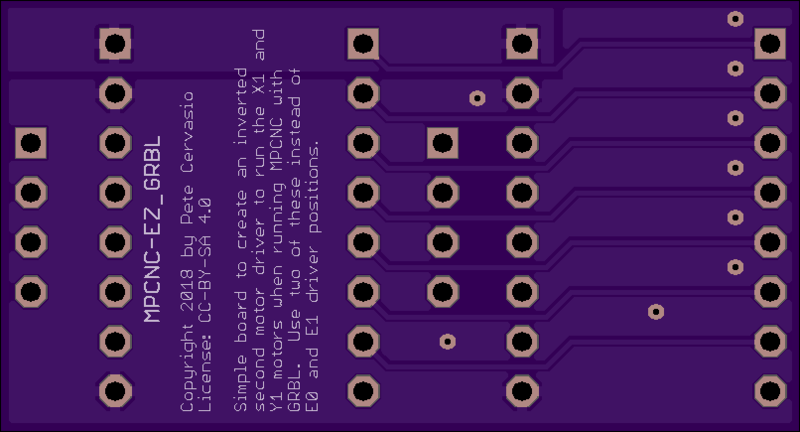 2 layer board of 1.61 x 0.87 inches (40.9 x 22.0 mm). Uploaded: November 9th, 2018 03:30. A simple way to use the grbl firmware on an Arduino NANO CNC board with a Mostly Printed CNC (MPCNC). The dual motors on X and Y need to spin in opposite directions. Rather than using a RAMPS and hacking up the grbl software to allow E0 and E1 to be used as secondary X and Y axes, or wiring the motors in parallel and only getting half the current to each, this board can be plugged into the X and Y motor driver positions of the CNC board along with a pair of drivers. R1 = 1k. R2 =10k. Q1 = MMBT3904. 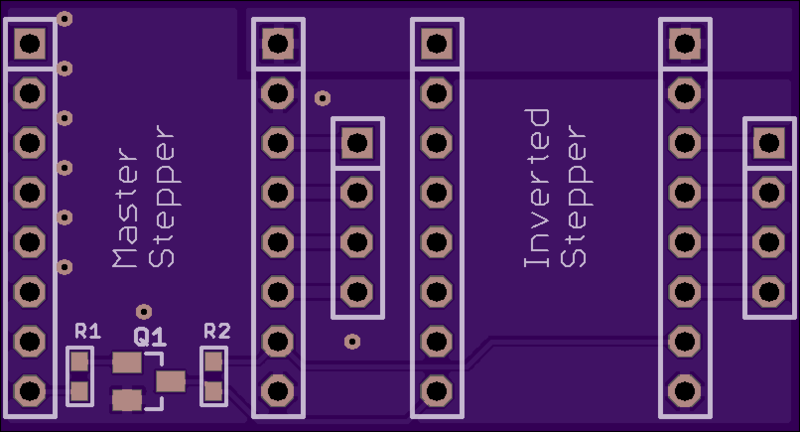 For each board you need two eight-pin Arduino shield style headers (male and female together), two eight-pin female headers for your 2nd stepper driver, and a pair of four-pin headers to connect your motors to. Edit: Despite my initial thinking, this really doesn’t work with a Mega/RAMPS combination because of pin spacing. It does, however, work great for the Arduino Nano CNC shields (the ones I have were sold as “CNC Shield V4 for Arduino Nano” and have a ‘Keyes CNC’ label on it and a ‘2014/07/01’ date code).